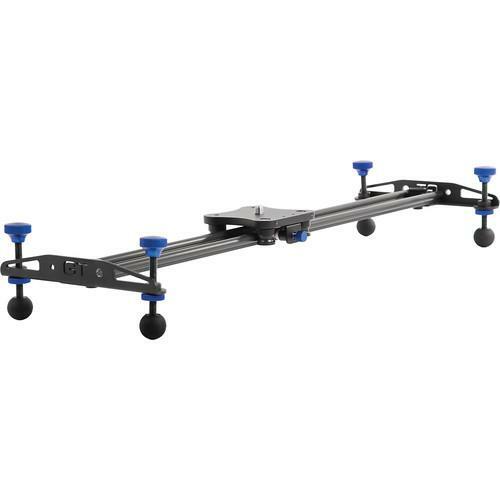 We recommend checking out our discussion threads on the Glidetrack SD Aero Lite Carriage with Track ( 25"), which address similar problems with connecting and setting up Camera Sliders Glidetrack. The user manual for the Glidetrack SD Aero Lite Carriage with Track ( 25") provides necessary instructions for the proper use of the product Professional Video - Tripods, Supports & Rigs - Camera Sliders. With its one piece track design and self lubricating bearings on the slider carriage, the Glidetrack SD Aero Lite Carriage with Track is suitable for use with cameras from a Sony NEX-7 to a Canon 5D Mark III. The slider supports up to 22 pounds, and it features a 25" long 6061 hard anodized extruded aluminum track, providing a smooth surface for the precision made self lubricating plastic bearings. Featuring three sets of 1/4"-20 and 3/8"-16 mounting screws, you can support the track on a tripod in the center, or by using two tripods, one at each end. The carriage is backwards compatible with all previous Glidetrack SD tracks, and features a flat mounting surface with a 3/8"-16 mounting screw for a flat base fluid head. The slider's bearings are self lubricating, and virtually maintenance free in normal use. Adjusting the tightness of the bearings on the track is a simple process requiring the adjustment of a grub/set screw, and can be accomplished with the carriage on the track. The carriage incorporates a brake mechanism that presses a felt-like pad against the rails to lock the carriage against movement, without damaging the rails. The included legs support the included feet, which allow you to set up and level the rails on the floor, ground, or tabletop. If you own a Glidetrack camera sliders and have a user manual in electronic form, you can upload it to this website using the link on the right side of the screen. Box Dimensions (LxWxH) 40.5 x 5.75 x 3.0"
The user manual for the Glidetrack SD Aero Lite Carriage with Track ( 25") can be downloaded in .pdf format if it did not come with your new camera sliders, although the seller is required to supply one. It is also quite common that customers throw out the user manual with the box, or put the CD away somewhere and then can’t find it. That’s why we and other Glidetrack users keep a unique electronic library for Glidetrack camera sliderss, where you can use our link to download the user manual for the Glidetrack SD Aero Lite Carriage with Track ( 25"). The user manual lists all of the functions of the Glidetrack SD Aero Lite Carriage with Track ( 25"), all the basic and advanced features and tells you how to use the camera sliders. The manual also provides troubleshooting for common problems. Even greater detail is provided by the service manual, which is not typically shipped with the product, but which can often be downloaded from Glidetrack service. If you want to help expand our database, you can upload a link to this website to download a user manual or service manual, ideally in .pdf format. These pages are created by you – users of the Glidetrack SD Aero Lite Carriage with Track ( 25"). User manuals are also available on the Glidetrack website under Professional Video - Tripods, Supports & Rigs - Camera Sliders.